As fiscal events go, Budget 2016 was pretty fiscally eventful. As the extraordinary political fall-out continues, here at the Trust’s insight and engagement team we’ve been examining what the rest of the Budget means for people in financial difficulty. Let’s start with the good news first. Many of the Budget’s measures on tax and savings will be widely welcomed. Further increases in the personal allowance continue the government’s strategy of lifting many low-income people out of income tax altogether, which represents real help to many of the people who need it most. Those earning more than £8,060 a year, however, still pay National Insurance contributions – a threshold that is now more than £3,000 less than that for the personal allowance. Narrowing this gap is something we hope the Chancellor will consider in a future Budget. The continued freeze on fuel duty is something that many expected to come to an end, given plunging petrol and diesel prices.  At National Debtline, however, our advisers know from the front-line that fuel costs can represent a substantial proportion of monthly outgoings for many low-paid households. The continued freeze will be a relief for many. It was also a good Budget for encouraging saving. We have strongly welcomed the Help To Save scheme, pre-announced by the Prime Minister last Monday. With its generous government match of 50 percent of savings could make a real difference in helping people to build up the rainy day savings – which we know is an essential tool in preventing problem debt. It is heartening to see Help To Save targeted at those who we would argue need it most – those on the lowest of incomes, through the criteria of receipt of Universal Credit or Working Tax Credit. Questions remain, of course, over the detail of the scheme – for instance, is two years really an appropriate length of time before bonuses are added, when very few people plan ahead in anything other than weeks, months or a single year. We will be making these and other points in the Treasury’s forthcoming consultation. The Lifetime ISA, too, is welcome – again with a surprisingly generous match of 25 percent, to encourage under-40s to save for either a house or retirement. We think that this could help many self-employed people in particular – a group that our recent Cost of Doing Business report showed has a worrying lack of financial resilience. In fact, self-employed people, often overlooked in previous Budgets, had a remarkably good day last Wednesday. The long-called-for scrapping of Class 2 NICs will make a real difference – removing an additional fixed-cost for a group of taxpayers whose often uneven incomes can turn fixed costs into constant headaches. The doubling of small business rate relief is also something we have called for, and will make a big difference to many small business owners with premises. So far, so good. Now for the bad news. Firstly, on welfare. Disabled people around the country will be relieved that further cuts to disability benefits have been shelved – and the new work and pensions secretary Stephen Crabb’s statement that there will be no *new* cuts to the welfare budget for the remainder of this Parliament is also welcome. Yet the need to recoup £4.4 billion lost by abandoning the PIP cuts remains – and it still unclear how this will be attempted. We must also not forget the slew of existing welfare cuts that are due to join the statute book any day with the assent of the Welfare Reform and Work Bill. The four-year freeze in working age benefits, cuts affecting those already on Universal Credit that are equivalent to those famously defeated in the House of Lords tax credits vote, and the scaling back of Support for Mortgage Interest will have a significant impact on many people who are already under significant financial pressure. Other measures in Budget 2016 will add to this pressure. The Chancellor’s 0.5 percent rise in Insurance Premium Tax is likely to be passed on to consumers – with predictions of the impact on the typical household ranging from £10 to £30 a year. That might not sound like a lot, but will be one more factor adding to the pressure facing household budgets. Higher premiums will also discourage some from taking out insurance – which with the right product, can be a crucial tool in guarding against unexpected income shocks. The debate over the Chancellor’s highly unexpected Sugar Levy continues to rage – but broadly it seems to have been well received. The public policy aim of the Levy is clearly to change products and consumer behaviour, rather than increase prices – but it’s safe to say the jury is out on whether this will indeed by the effect. News of legal challenges clearly make this one to watch. And finally – there’s the elephant in the room. 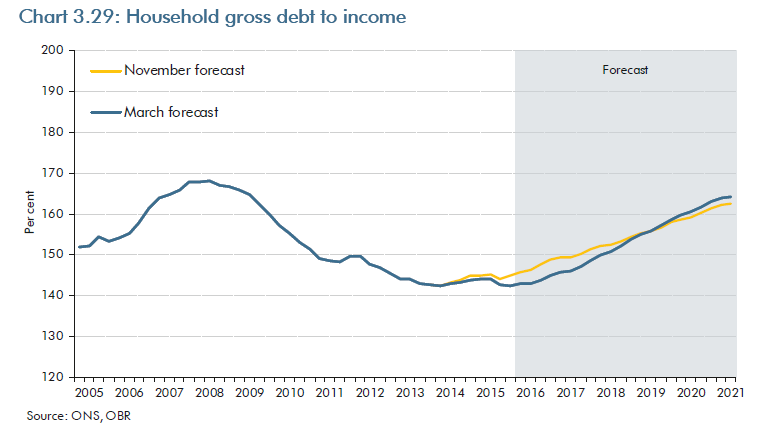 Like everyone else in the debt advice sector, we always have one eye on the Budget, and the other on the Office for Budget Responsibility’s updated forecasts for household debt. This is now forecast to reach 164 percent of household incomes by 2021 – virtually unchanged from the 163 percent last Autumn, and down on previous forecasts. Nevertheless, this still takes household debt to just five percent of incomes below its pre-recession peak. While most households will be able to handle this extra borrowing, we are concerned that a minority are turning to credit to make ends meet. Throw in the impact of the welfare changes already passed and the prospect of interest rate rises – now more distant, but still on the horizon – and it’s clear that the demand for debt advice could increase significantly. That’s why it has never been more important to ensure that anyone in financial difficulty receives the free advice they need. 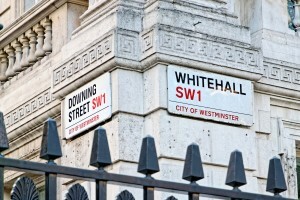 The Treasury’s response to the Personal Finance Guidance review – including the scrapping of the Money Advice Service – should therefore be seen as an opportunity to get this right. As I’ve just hit 1,000 words, that’s a subject for another blog! One final word from me, however, on Budget 2016 – on what it didn’t include. In our budget submission we made the case for several measures that we will continue to press for in the coming months and years. Action to make public sector debt collection fairer and more effective (following our Stop The Knock campaign), a full review of debt solutions including progressing the promised Breathing Space review, and the integration of free debt advice into Universal Support are all much-needed interventions that would significantly help people in financial difficulty.